The LakeGeorge.com Brewfest was a weekend-long premier beer tasting event in Lake George, NY where attendees could sample beers from over 60 breweries from around the country, feast on delectable foods, listen to live music, and be dazzled by an evening display of fireworks. As is the case with almost any event, generating strong ticket sales benefits the event organizer and vendors alike, while high attendance numbers give vendors a profound incentive to return the following year. The challenge for the LakeGeorge.com Brewfest was to raise awareness about the event, position their message in front of an audience that would be most likely to attend, and time the promotions just right in the months leading up to the big weekend. When the Brewfest owners sat down with our team at Mannix Marketing to discuss promotional ideas for marketing the Brewfest, we crafted a digital marketing program designed to help him reach more potential attendees online and encourage people to learn more about this exciting event! When it comes to promoting special events, timing can have a major impact on ticket sales and attendance. If you promote your event too early then people may forget about it; if you promote your event too late, however, then those people who would have attended may already be committed to other plans by the time they finally hear about your event. Each day, our regional online guides – such as LakeGeorge.com, Adirondack.net, Saratoga.com, and Albany.com – attract thousands of people who are searching for things to do in the Capital District. Advertising space within the various sections of these guides helps businesses market their special offers and events to a highly targeted audience that is already looking for local events and things to do. Display ad with unique branding, event info, and a specific call-to-action (“Get Tickets!”) featured in various sections of Mannix Marketing’s regional online guides. A specially designed mobile version of the ad was placed throughout the LakeGeorge.com, GlensFallsRegion.com, and Saratoga.com mobile websites to target people who were coming to these sites on their mobile devices. In less than 2 months, this display ad was seen over 1.4 million times on our regional online guides and drove 20,584 visitors to the Brewfest’s landing page on LakeGeorge.com where potential attendees could quickly find more detailed information about the event (e.g. confirmed brewers, food vendors, bands, parking, venue, ticket information). Social media is undeniably the new word of mouth. Platforms like Facebook and Twitter are now the place where people hear about fun and exciting things to do, places to visit, and events to attend. To help the LakeGeorge.com Brewfest tap into a highly relevant and engaged audience on social media, we promoted the event through our Adirondacks, Lake George, Saratoga Springs, Glens Falls, and Albany Facebook pages. Marketing the Brewfest through our Facebook pages began in late July and continued right up to the week of the main event. 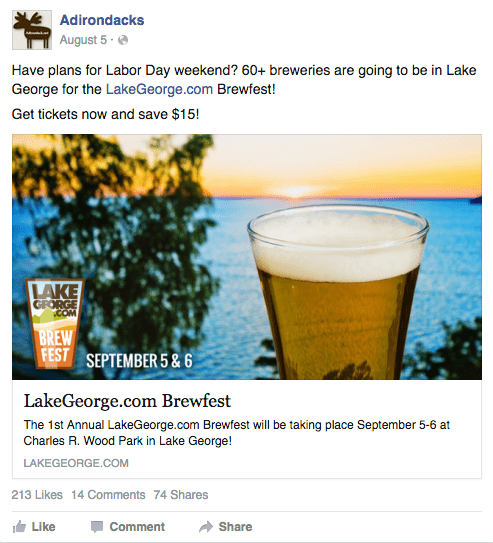 Each of the 12 promotional Facebook posts included a visually engaging image, teaser information, and a link directing people to the Brewfest’s landing page on LakeGeorge.com. As if promoting the event on these highly relevant Facebook pages didn’t provide enough exposure already, we also cross-promoted several of the Facebook posts through the LakeGeorge.com and Albany.com Twitter accounts. Over the course of just a few weeks, these promoted Facebook posts received over 4,200 Link Clicks and drove a tremendous amount of traffic from Facebook to the Brewfest’s landing page. This Facebook post promoting the LakeGeorge.com Brewfest through Adirondacks’ Facebook page reached over 14,400 users and generated 296 clicks! Email marketing can be an extremely effective tool for capturing your audiences’ attention. With several growing lists of email newsletter subscribers from our regional guides, local businesses can place an advertisement for their events, deals, and special promotions in these monthly email newsletter campaigns to reach a highly targeted group of people. 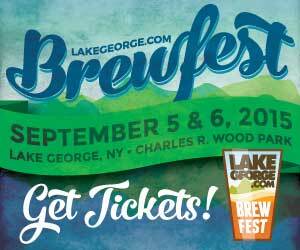 Between July – September, the Brewfest’s ad was featured in 3 monthly newsletters which were sent to our LakeGeorge.com, GlensFallsRegion.com, and Saratoga.com list of email subscribers. The early promotion helped put the event on peoples’ radar, while the ads in subsequent campaigns kept the Brewfest top of mind as the event date grew near. Each newsletter was opened by thousands of subscribers and helped drive more inquiries to the event’s landing page. The 2015 LakeGeorge.com Brewfest was a major success, bringing in strong ticket sales and remarkable attendance numbers. Promoting the event with Mannix Marketing helped Bill spread the word about the Brewfest to a highly qualified audience, attract more attendees to the event, and let him get back to focusing on the many other details that go into creating a successful event.